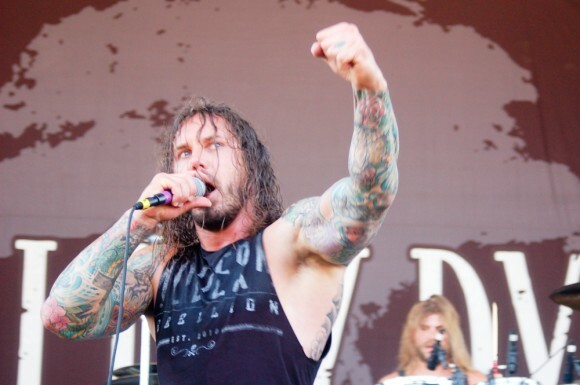 As I Lay Dying frontman Tim Lambesis’ lawyer Thomas Wawick said in court his client was on steroids when he tried to hire a hitman to kill his wife. Lambesis was arrested and booked at the Vista Detention Facility on May 7 and charged with soliciting an undercover police officer to kill his estranged wife for $1000 at a Barnes & Noble bookstore in Oceanside, CA, according to San Diego Sheriff’s Department. He pleaded not guilty at an arraignment. Lambesis had his bail lowered from $3 million to $2 million during a May 17 bail review hearing. But prosecutors initially requested Superior Court Judge Martin Staven to set Lambesis’ bail at $20, due to him “substantially motivated to kill his wife. Warrick said he remains in jail due to his family’s inability to make the asking bail price of $250,000. His eight year marriage with wife Meggan ended last summer after Lambesis told her in an email that he no longer loved her and admitted that he no longer believed in God. Meggan later learned about his multiple affairs throughout their marriage and also having a girlfriend at the time. Meggan filed for divorce in September 2012, citing irreconcilable differences, and also noting her husband’s recent preoccupation with bodybuilding. There were concerns over his abilities to care for their three adopted children from Ethiopia, due to his spending hours at the gym, or falling asleep by a pool, when he was supposed to be watching the children. As I Lay Dying recently withdrew from the forthcoming Killswitch Engage US tour.